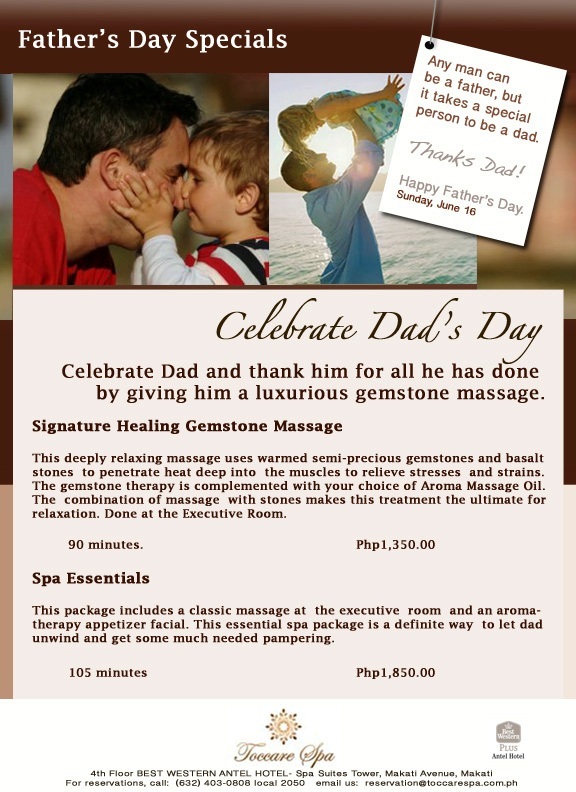 The Food Alphabet and More: Celebrate Dad's Day : Give Dad a break he deserves at Toccare Spa + Gemstone massage giveaway for DAD!!! And with that, we would like to give our thanks and show our appreciation to our one and only Dad! 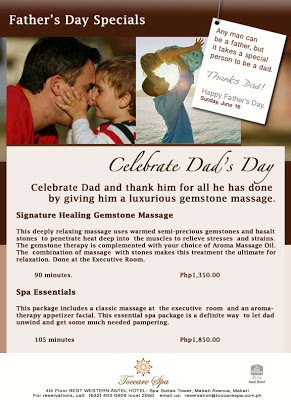 Want to get Dad that much needed pampering? 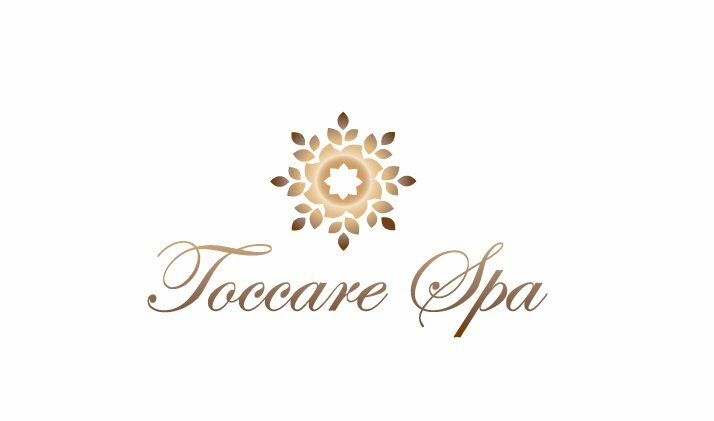 Then you got to join in for this chance to win one of three Signature Healing Gemstone Massage for Dad only from Toccare Spa, offering only the best service and utmost satisfaction one treatment at a time. Happy Father's day to all of you! My dad is the best because he has given me everything I need and have sacrificed a lot for our family. my dad is the best because he is a perfect blend of a father and a friend. My Dad is the best Dad in the world because he loves us all,provides all our needs & never leave us alone. My dad is the greatest dad in the world because he loves me for what I am. He is always there for me through thick and thin. He encourages me to be the best person I can be. he is simply the best daddy! My dad is the greatest dad because he is the most patient and caring person I ever knew. I lost my dad when I was in high school but this is a good treat for dads. My dad is the best in the world because he is the only guy in the world that would not break my heart! I won't be able to join since we're residing in the Visayas, but thanks for hosting this giveaway! I'm sure your father is still with you and your mother in both heart and spirit. My dad is the greatest because he is fair and generous to us all. My father went through different trials but he still managed to overcome it. He had depression when we lose our Mom 12 years ago. We're so thankful and happy that he helped himself to overcome it and continue his life with us and do his responsibilities as a father, and at the same time as a mother. He sacrificed a lot. He's really the greatest father in the world! My father is a very wonderful person. He may not have provided me and my mom the best of what the world can offer but he made sure that I have the things I need in order to grow in the best way possible. He may not be there physically in all the important events of my life but he made sure I felt his presence all the time! We lost our mom when we were just kids, me as the eldest and who have three siblings of 11,9,7 years of age, very young and still longing for some motherly love but my Dad really did a great job of not letting us feel so down or something was missing as we grew up, he did provide not just material things but lots of love , a mom and dad rolled into one, not thinking of his own happiness. He really made sure we all finished college and we really owe everything from him on what we are at what we became, I am so proud for giving us the most wonderful Dad in the whole world, the greatest one to be exact. The professional massage therapist can guide us what kind of massage we need. There are many types of massage it depends what you need. For relaxation Massage in Miami offers a wide technique for massage to relieve your stress and to make you feel better.